Plans for two new bridges near Glasgow have taken a step forward. 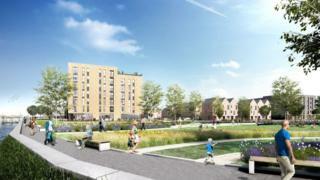 They are part of a scheme to regenerate part of the Clyde waterfront and improve the area around Glasgow Airport. The project has been made possible through the City Deal covering the region around Glasgow. The deal is a £1.3bn project funded by the UK and Scottish governments, with eight local authorities around the city involved. Planning applications have now been submitted for two schemes led by Renfrewshire Council. One aims to regenerate part of the waterfront - and includes a road bridge across the Clyde between Renfrew and Yoker. The other includes work around Glasgow Airport - with a new bridge over the White Cart Water. If the schemes get planning permission, construction could be completed by 2020. Bob Grant, chief executive of Renfrewshire Chamber of Commerce, said the City Deal projects would bring jobs and business benefits to the local area. He said: "These projects offer tremendous benefits for local businesses and have the potential to transform how we do business in Renfrewshire. "These major infrastructure investments will make it easier for employers to do business, easier for employees to get to and from their places of work and open up the potential for future investment. "Around 1,400 jobs are expected during the construction period and a further 11,000 permanent jobs could be created through existing business expansion and new businesses being attracted to the area as a result of the City Deal infrastructure investment." He added: "Improved connections will also benefit the public and local employers, with 59,000 jobs becoming more accessible to Renfrewshire residents. "I am very excited at the potential of the Glasgow Airport Investment Area to bring highly-skilled jobs to the area. The signs are already there - the first minister recently announced that an £8.9m specialist centre to develop new manufacturing processes for lightweight materials for the aerospace and automotive industries will be established here in Renfrewshire. "It has been encouraging to see the public are firmly behind these projects and I look forward to seeing the work get under way. These are key projects in the Glasgow City Region City Deal, which has the potential to unlock £3.3bn in private sector investment benefitting the whole region."